The University of Oxford has apologised to Labour MP David Lammy after it retweeted a post calling his criticism of the prestigious institution’s lack of student diversity as “bitter”. The original tweet, sent by a University of Oxford student, was in response to Mr Lammy’s description of the institution as being “a bastion of white, middle class, southern privilege”. Mr Lammy, a former higher education minister, made the remarks after new figures revealed that more than a third of Oxford colleges had admitted three or fewer black applicants over three years. The proportion of black UK students admitted to Oxford last year was less than 2 per cent – and more than a quarter of colleges failed to admit a single black British student in some years between 2015 and 2017, the new report from the university shows. The university admitted that it “still has more work to do in attracting the most talented students from all backgrounds” and recognised that the report shows it needs to “make more progress”. But this morning, the University of Oxford twitter account retweeted a post which accused Mr Lammy’s “constant bitter criticism” as being “bang out of order”. Mr Lammy asked if the tweet represented the university’s official position – at which point a senior staff member at the University of Oxford apologised and took responsibility. Ceri Thomas, Oxford’s director of public affairs, tweeted that Mr Lammy’s comments showed “no sign of bitterness” and added there was “work to do” to improve student diversity. Hello @DavidLammy Apologies: it was my call to retweet our students including @liambeadle. 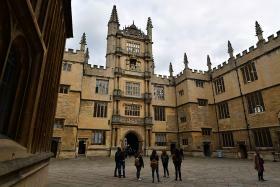 But we agree with you that Oxford needs to do more and criticism of us is no sign of bitterness. There’s been progress, but work to do. In October last year, Mr Lammy accused the prestigious institution of “social apartheid” after a Freedom of Information request by him revealed thirteen Oxford colleges had failed to make a single offer to black A-level applicants over a six-year period. This prompted more than 100 MPs to write to Oxford and Cambridge urging the universities to take action to recruit more students from under-represented backgrounds. Speaking to World at One, Universities Minister Sam Gyimah, who is black and went to Oxford, said the institution needed to “double down” on its work to engage with students earlier on. He said: “Where I think we need further and faster progress is that it’s not enough for the universities just to work with those who are applying at the A-level stage, they need to start earlier because the students that are successful actually start their preparation a lot earlier. The report also revealed today that there was a marginal increase in the number of admissions from state schools during the same period, from 57 per cent in 2013 to 58 per cent in 2017. Just under half (48 per cent) of UK students admitted to Oxford University over the three-year period were from London and the south east – compared to just 2 per cent from the north east.